Mignonette is a hairless, sprawling, 'floppy' biennial. Generally, it is about 12 inches tall but can be significantly taller / bigger. 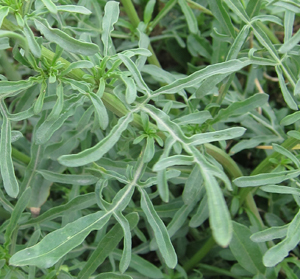 There may be a basal rosette of leaves. The leaves are deeply cut and have a pinnate appearance; the margin is wavy - see adjacent image. 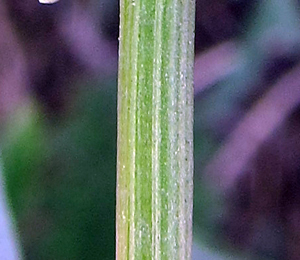 The stem has a number of ridges - see image below. The flowers are a green yellow - with 6 sepals and 6 petals. They are densely packed together to form a spike. 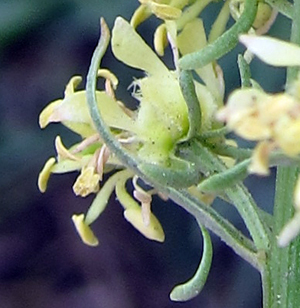 The upper pair of petals have lobes, and there are numerous stamens (between 12 and 20). 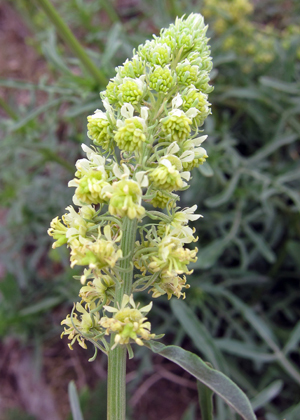 Mignonette is found on waste ground, along footpaths and the margins of fields. It is 'popular' with bees and butterflies. 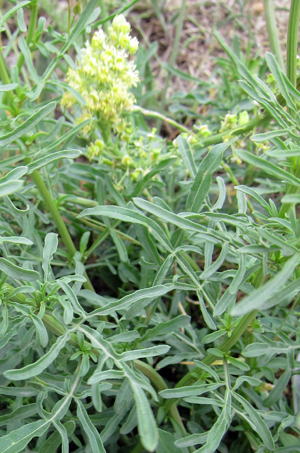 In the past, a yellow dye was extracted from the plant.